Ready for your reservation? Great! Let’s go! We are happy to guide you through our booking tool! First of all, thank you for answering our questions, in order to determine your price and your rental date. You will then be able to book in real time your rental in one of the available time slots. You will not have to provide your credit card information. Payment must be completed on site at our booth. 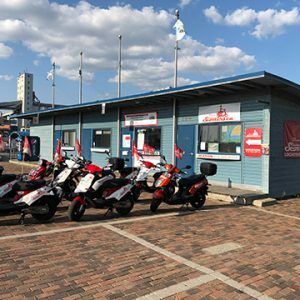 Choose from our 4 scooter rental locations. All our departures are located in beautiful places that will charm you.